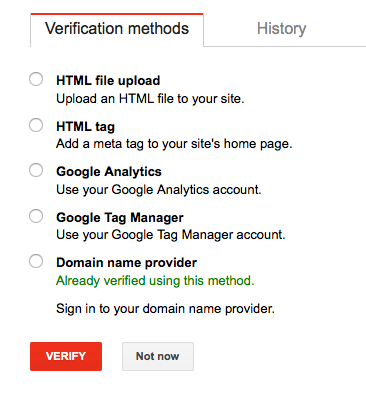 How Do You Verify Your WordPress Website With Google? 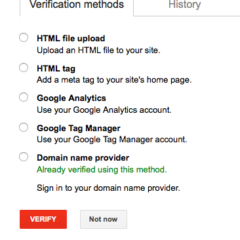 How do you verify your WordPress website with Google? There are several ways to do this (see image below) but one simple way is by adding an html tag to your site’s home page. This article will show you how to do that. This turned out to be pretty simple but freaked out a bit since I’m not a coder or web developer. I thought of asking the web developer on our team to help me out but it seemed too simple a task to bother him, plus I was looking for a small win in an area I’m not an expert at. So I decided to go for it and folks my website did not crash. So there must be others like me out there that may need help with verifying their website with Google. Google Webmaster gives you different options to verify your website but today I’m going to show you how to verify your WordPress website by adding a html tag to your site’s home page. You basically have to copy the meta tag (a piece of code that Google gives you) and paste it in body of code called header.php. Now where do you find this header.php? Now look on the right column for the file called header.php and click on it to open the document with the code. Now go back to Google and check to see if you’re website has been verified.